President Donald J. Trump has loosened the federal government’s grip on businesses looking to secure federal contracts. On March 27, 2017, the president signed Executive Order 13782 revoking executive orders by President Barak Obama that had regulated the conduct of federal contractors. President Trump’s EO 13782 expressly revokes Obama’s EO 13673, also known as the “Fair Pay and Safe Workplaces” order, as well as subsequent amendments, set forth in Section 3 of EOs 13683 and 13738. 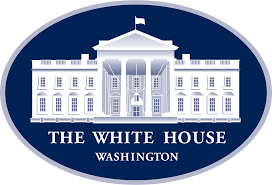 President Obama issued EO 13673 on July 31, 2014, with the stated purpose of ensuring that federal contractors comply with applicable labor laws. EO 13673 contained three major provisions that separately addressed (i) disclosure of compliance with labor laws, (ii) paycheck transparency and (iii) arbitration clauses for claims of sexual harassment, sexual assault, and discrimination. More specifically, EO 13673 required federal agencies to include provisions in their solicitations to potential service providers directing them to disclose “whether there has been any administrative merits determination, arbitral award or decision, or civil judgment” for violations of certain labor laws issued against them within the preceding three years. EO 13673 further required agencies to include in their solicitations and contracts a provision that service providers are prohibited from including in their contracts with employees clauses requiring the arbitration of claims arising under Title VII of the Civil Rights Act of 1964, or sounding in any tort relating to or arising out of sexual assault or harassment. Rulemaking is underway to amend the Federal Acquisition Regulation (FAR) to remove the Fair Pay and Safe Workplaces Final Rule, the General Services Administration (GSA) has said in guidance to federal agencies instructing them not to wait for the formal rescission to ensure certain contract clauses are not in new or existing government contracts and solicitations. 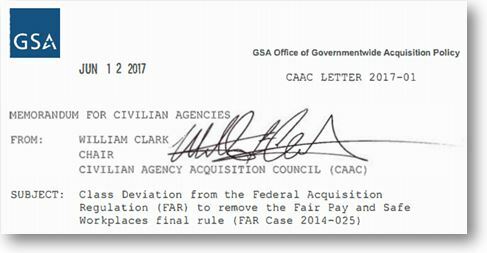 The GSA’s “Class Deviation from the Federal Acquisition Regulation (FAR) to remove the Fair Pay and Safe Workplaces final rule (FAR Case 2014-025)” implements and provides guidance to federal agencies and contracting officers regarding Executive Order 13782, “Removal of the Fair Pay and Safe Workplaces Final Rule,” signed by President Donald Trump on March, 27, 2017. The GSA memorandum notes the rule is null and void as a result of both legislative and Executive Order actions. Just in time for Labor Day, the Labor Department and FAR Council issued a final rule and accompanying “Guidance” to implement the Fair Pay and Safe Workplaces Executive Order. The new regulations will take effect on October 25, 2016. The regulations—which run to nearly 900 pages—contain a number of changes from the proposed regulations to demonstrate that the Department listened to stakeholders during the lengthy comment period. Despite some concessions to industry comments, the final regulations still establish substantial compliance obligations. 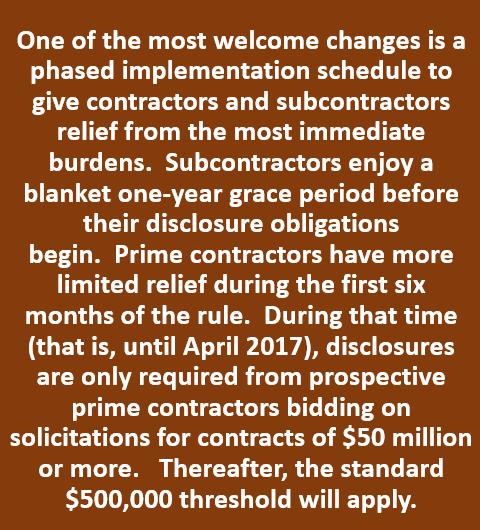 In light of those burdens, the contracting community is well advised to invest time to understand these provisions. In this post, we summarize key changes and examine the way ahead for contractors.